While in Canada, I was hosting Aahaa Kaapi Klub from there and the last Thursday and Friday, I invited Sathya, a singer in Toronto and Ralph of Agni to speak on the show. It was fun to say the least and this is the last link on Friday. Our Audio Engineer at Aahaa FM seemed to have worked his magic on an otherwise normal link. Loved listening to it. Your voice is mesmerising while singing and while speaking it's like lullaby to us. BTW await your blog on your trip to Italy with Maestro (U sung well in that concert) and also my Best Wishes on winning award for Best Femal Singer!!!!! All the Best for all your present and future projects!!!! Very nice Chinmayi! Many thanks for posting these nice numbers. Living in Blore, I dont get to listen to the Tamil FM channels. Miss all that arattai and tamil kusumbu;-) apart from the good music. Thats one other reason why I want to get back to our Singaara Chennai. hey :) gurupriya here. just listened to the ghazal. awesome to say the least. is it close to ahir bhairav? i remember amma yelling at me once when i sang an ahir bhairav song during the sangam competiton saying i was singing it without any feel. now i know what she meant. you've really immersed /absorbed. i dunno how to put it. but akka, its really nice. ive been listening to it continuosly. You are truly Blessed with a melting voice. I have been reading your space since beginning. awesome yaar...especially the udhaya part...keep rocking! No words. Keep rocking Chin! Balasubramaniam: it came in an interview.. I guess i ll have to refer to that myself.. its been almost 5 years since that happened.. sometimes no matter how wonderful something is, some details get hazy. Akka..i seriously don't know what to say! !..your beginning ghazal way fantafabulous.. and 'Udhya Udhaya' song,my God.......it was sooo divine and i lost myself totally hearing to it..to be honest to myself i've not heard the actual audio track many times..but i completely and absolutely started to like this out and out and what a renderation!! i swear it was so Divine..I've read in of your posts which said that this song had made you give a listen to it alomost everyday in a week and that you loved this song.. i feel the song now akka.. each time in one song or the other of your's,you make me shed tears out of the happiness of the your renderation of the song and the feel you give to it and this inludes in my list.. keep making me cry more from your songs..
And also akka, i've recorded this 'Udhaya Udhaya' song's part sung by you with my mobile and now i've set this as the ringing tone..God bless with even more divinty in your singing and voice..take care akka..
Beautiful Voice....Is the original by Hariharan ji? Udhaya Udhaya - IMHO is one of ARR's best. The instruments he has used..and the orchestration is truly mesmerizing along with the silky voice of Hariharan! It is always fresh inspite of the song being 4-5 years old I guess. Your Ghazal lead was nice and I was hoping you'll sing it..and you did it very nice indeed ( though you sodhappufied the words :-) ). Chinmayi, I recently heard your song about Lord Muruga in Hindustani on Doordharsan when I visited India. Looked for your album everywhere but couldn't get it. I would love to get that album. Your voice is mesmermizing. Where can i get your cds? Hey, I just stumbled upon your blog looking for K.M Conservatory. Heard the piece you had posted yesterday, you have an awesome voice! I dunno how I missed you on radio when I was in chennai. Keep rocking and good luck with the national award. 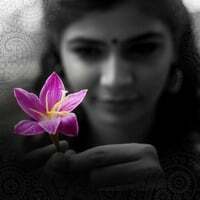 Great audio Chinmayi. Must insist you r voice gets better by the day! First day, u think it can't possibly get any better than that, and u beat it the next day!!! U ain't on Orkut anymore? Girl you rock! I don't understand Tamil. I listen to Telugu and Hindi film music usually. And I became your fan after "Sahana..". You saved the grace of the song. The otherwise superb Udit-ji's horrible pronunciations in the song drill my ears and heart! You saved the wonderful song, no matter how modest you will be about the fact! Your dubbing assignments! One strange thing about them is, 'I', the self proclaimed "voice sniffer",:D can't make out if it is your voice! Your voice is completely different when you speak, in a nice way ofcourse! And multi-tasking! You too have just 24 hours a day or did you manage to get some magic wand? Amazing! beautiful Chinmayee! Such a sweet, mesmerizing voice! Udaya is one of my favorite songs by Rahman. Wonderful to hear you sing it, & listen to Tamil radio stations since we don't that opp from U.S.
Splendid job on the ghazal & Udaya,again! Seems like Hipcast is having some issues. Came back to listen to this tune, remembering a friend talk about this. Hope you do have the original mp3 and can host it somewhere else?